SITHOM 2018 — Australian Association of Street Photographers Inc. The "Shot in the Heart of Melbourne" exhibition has closed. 430 Albert Street, East Melbourne, Victoria 3002. 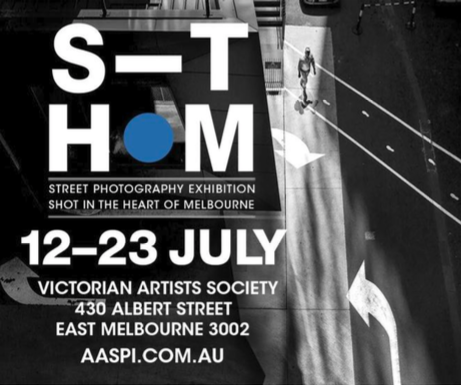 The Australian Association of Street Photographers Incorporated (AASPI), who exhibit under the banner of 'Shot in the Heart of Melbourne' (SITHOM), are a group of avid photographers in the "street photography genre", or as it's commonly called, just "street". Now in its 7th year, SITHOM is a street photography and photojournalism exhibition that celebrates the decisive, and often indecisive, but always graceful moments within our gritty, yet beautiful city of Melbourne. The exhibition showcases individual captures from thirty five diverse and enthusiastic photographers, who have focused on the eclectic hub that is Melbourne. They capture ephemeral moments. Raw, candid and completely unique. Shot in the Heart of Melbourne is a candid homage to the people, architecture and street life that bring this individual city to life every day. In recent times, it seems that the time honoured traditional form of street photography has been overshadowed by a flood of more contemporary, staged, digitally manipulated and over processed genres of photography. Those who love the genre of "street", know the elation inside, when they capture the moment of something truly unique, fleeting, decisive, and never to be repeated! What is "street photography"? This definition is subjective and varies from person to person, but at best, it's a visual documentation, focusing on a moment in time, of everyday life of society, un-manipulated and usually without the subject's awareness. Street photography doesn't necessarily need people in it. An object, shadow, ray of light can be the subject, rather than a human form.